Living on the water is a dream for many — fortunately, this design for a solar-powered floating home may soon see open water! Brought to you by the same designers who came up with the futuristic bicycle sharing system for Copenhagen, RAFAA Architecture & Designs have conceived of a mobile floating home called The Last Resort. The design recently won a competition, and with funding underway the team expects to begin fabrication on these sleek water homes by the end of the year. The floating home is about 5 meters wide and 15 meters long with two levels. Sleeping bunks, mechanical equipment and hatches are on the lower level and the upper level contains living space, a kitchen, a bathroom and two bedrooms. In total there are six beds and a sliding panel helps close off the rooms for more privacy. Vertical blinds on the facade act as shading devices for the interior as well as a privacy system. Stairs lead up to the roof, which serves as an extra deck, and roof-integrated solar panels generate electricity for the two electric engines that propel the home. RAFAA entered their design for mobile floating architecture in a design competition organized by the Internationale Bauausstellung in Germany. They recently brought home first prize, and construction on several of these houses is expected to begin by the end of the year. The homes were designed for Lusatian Lakeland and the form of the homes was actually inspired by the waterfront. We’re looking forward seeing these efficient floating comes come to life. This is sure to save the world as the floating home serves as damper for the wave. The more floating homes, the bigger wave they can damp. Also the human natural wastes serve as fertiliser to the water plant which provide food for the water creatures. We can then eat the seaweed and seafood. This also help restore the balance between oxygen and carbon dioxide and reverse the effect of global warming. Living on the water is a dream for many -- fortunately, this design for a solar-powered floating home may soon see open water! Brought to you by the same designers who came up with the futuristic bicycle sharing system for Copenhagen, RAFAA Architecture & Designs have conceived of a mobile floating home called The Last Resort. 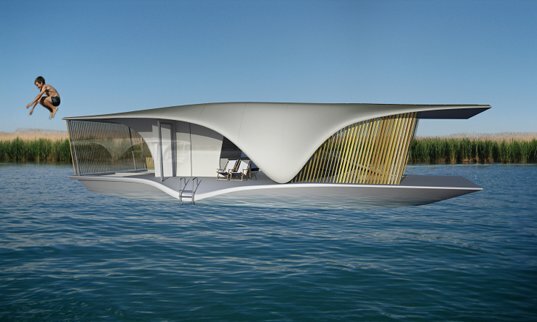 The design recently won a competition, and with funding underway the team expects to begin fabrication on these sleek water homes by the end of the year.